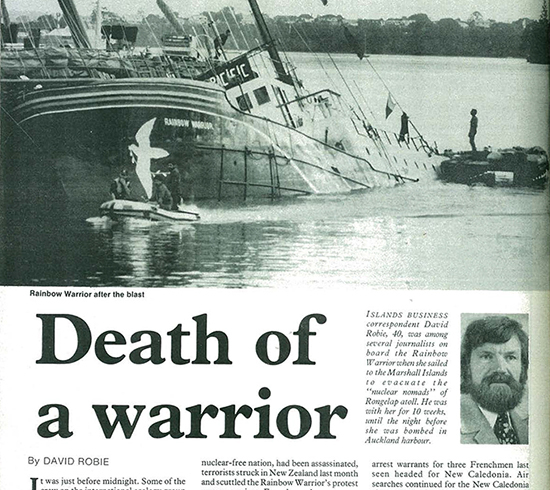 AUCKLAND (ABC Nightlife/Asia Pacific Report/Pacific Media Watch): Pacific environmental and political journalist David Robie has recalled the bombing of the original Greenpeace flagship Rainbow Warrior 33 years ago in an interview with host Sarah Macdonald on the ABC’s Nightlife programme. Dr Robie, now professor of journalism and director of the Pacific Media Centre at Auckland University of Technology, wrote the 1986 book Eyes Of Fire: Last Voyage of the Rainbow Warrior that has been published in four countries and five editions. He spoke of the humanitarian voyage of the Rainbow Warrior to Rongelap Atoll in the Marshall Islands to fetch the islanders to safety in a four-voyage relocation mission. The Rongelap community had been ravaged by the fallout and the long-term health impact of US nuclear testing. Dr Robie was awarded the 1985 Media Peace Prize by the NZ Peace Foundation for his coverage. His reflections were broadcast in a 23-minute programme broadcast at the weekend marking the bombing by French secret agents on 10 July 1985.